If your kids aren’t already avid fans of Wow! Wow! Wubbzy! and you’re curious about what its all about, simply continue reading to discover everything you need to know about the animated kids’ TV show Wow! Wow! Wubbzy! Wow! Wow! Wubbzy! is an animated kid’s TV show which was created for Nick Jnr and can be classed as both a kids’ comedy show and an educational kid’s show. So if you want your kids to watch a show which is funny and entertaining whilst still being educational, you may be interested in sitting down with your kids to watch an episode of Wow! Wow! Wubbzy! The main character of the show is, of course, Wubbzy, for who the whole show is named after. Wubbzy is a cute yellow, animal-like creature that looks a bit like a gerbil and who has a large, springy tail. 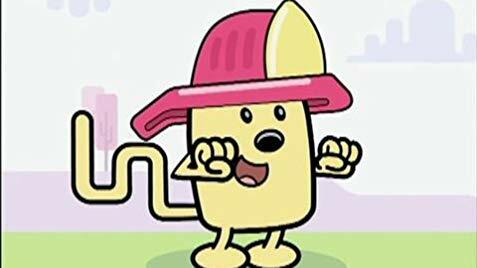 Wubbzy is a curious character who enjoys spending his time eating ice cream, chasing after futterflies and playing kickety-kick-ball with his friends. Though Wubbzy is the central character of the show, when Wubbzy has problems, he always relies on his friends to help him find a solution. Widget is Wubbzy’s best friend and is a mechanic who owns her very own mechanic shop. Widget looks like a pink bunny and is normally spotted wearing overalls. Anytime Wubbzy asks Widget to create an invention to solve a solution, Widget will come up with an overly complication solution. That often doesn’t solve Wubbzy’s problem. In fact, on the worst occasions Widget’s machines malfunction and create a lot of chaos. Walden is a purple creature who wears glasses and is the wise, intellectual of Wubbzy’s friendship group. Walden is inspired by everything around him, from ancient philosophy to tarot cards. When faced with a puzzling challenge, Walden’s solution is to think hard for a possible solution to his problem. Daizy the last of Wubbzy’s close friends and is a green dog-like creature who wears her hair in two ribbon adorned ponytails. Daizy did not appear in season one of Wow! Wow! Wubbzy! and instead made her debut on the season premiere of episode 2. At first Wubbzy finds it difficult to find common ground with Wubbzy as Wubbzy has the opposite interests as Wubbzy and enjoys activities such as dance, gardening and hosting tea parties for her dolls. However, Wubbzy soon discovers that it’s possible to be friends with someone who has different interests as long as you both care about each other. Wow! Wow! Wubzy! is known for producing catchy songs which your children will love singing along to. One example of which is Wubbzy I Love You. Which is likely to become your kids new favorite song. So if you’re looking to introduce your kids to a new animated series which is funny and cute and has a lot of heart it’s well worth watching an episode of Wow! Wow! Wubbzy! together.